Minnesota voters approved the Clean Water, Land and Legacy Amendment in November, 2008. The Legacy Amendment supports outdoor heritage, clean water, parks and trails, as well as arts, history and cultural heritage. As a Legacy fund beneficiary from the Arts and Cultural Heritage Fund, Como Park Zoo & Conservatory has been able to provide educational experiences for ages 1-100. An overview of each of our Legacy funded projects is in the tabs above and more details can be found by clicking on each project’s associated link. Our thanks to Minnesotans across the state who make these projects possible. The Legacy Amendment is a constitutional amendment adopted by Minnesota voters in November 2008. It raised the state sales tax by 3/8 of 1% for a period of 25 years and dedicated the earned revenue to clean water, parks, outdoor habitat, and arts and cultural heritage. A website was also created by the Minnesota Legislature to help citizens monitor how funds from the Legacy Amendment are being used. On the Minnesota’s Legacy: watch the progress you can see how funds are being invested across the state. Join Como Park Zoo and Conservatory as we explore science and nature through the eyes of engineers. The program selections provide something for everyone. During “Mini Movers,” our youngest learners will discover how animals stay safe in nature by swimming, hopping, flying, and stomping. This 30 – 45 minute program includes an interactive story, creative movement and animal visitors that are sure to delight! Mini Movers is appropriate for children up to five years of age and can accommodate up to 30 learners. We take learning to the next level with our school-aged “Everything Ecosystem” program. In our newly developed school-age program, “Everything Ecosystem,” students will learn the components of an ecosystem, as well as develop respect and empathy for plants and animals. This hands-on two part program will challenge students to use observational skills with live plants and animals in the classroom, while learning about how these organisms fit into ecosystems in nature. Students will practice using some of the methods that scientists use to study ecosystem health. They will discuss some real-life problems that many ecosystems face today, and students will be challenged to think for themselves to be problem-solvers. Students will take home ideas on how help their own community ecosystems, as well as ways to be better stewards of the Earth. Everything Ecosystem classes last approximately 75 minutes and are appropriate for groups up to 30 students. For adult audiences, Como Park Zoo and Conservatory will provide “Nature’s Wonder.” This interactive slide show presentation will highlight the science of biomimicry. Amazing technological advances have been made in all areas of science. Many of these advancements have been inspired by plants and animals. Participants will learn more about how nature is helping scientists clean up oil spills, reduce energy consumption, and make advancements in aviation just to name a few. The Natural Wonders lecture is approximately 45 – 60 minutes in length and appropriate for groups up to 100. Power point projection is utilized and requires appropriate viewing space. The Nature’s Engineers programs have been generously funded by the Legacy Amendment Arts and Cultural Heritage Grant and developed by the Education Department at Como Park Zoo and Conservatory. All applications will be reviewed before we contact the group lead to arrange programming. To ensure a timely response, please confirm that all information is complete. Be sure to take advantage of these wonderful programs designed to inspire us to not only learn about nature, but to learn from nature. Chat with Jessie, our Public Engagement Education Specialist, about the Endangered or Threatened animals we have at Como and what people can do to help them thrive in the wild. Each week will feature a different animal. S.A.F.E. Sundays occur every Sunday from 1:00-3:00PM. This program was funded in part or in whole with money from the vote of the people of Minnesota on November 4, 2008 which dedicated funding to preserve Minnesota’s art and cultural heritage. The Como Park Zoo and Conservatory Residency Program is a week-long learning opportunity for elementary school classrooms. Teachers move their classrooms to Como for an entire week to participate in hands-on, interdisciplinary, STEM focused activities. Como education staff partner with classroom teachers to deliver a program where students use the scientific method to do real-world learning about the plants and animals of Como. Teacher training is provided over the summer to help teachers prepare curriculum to teach during the trip and to incorporate the program throughout the school year in their classroom. 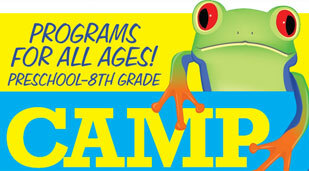 Free STEM based programs for schools and weekly on-site programs for the youngest visitors. 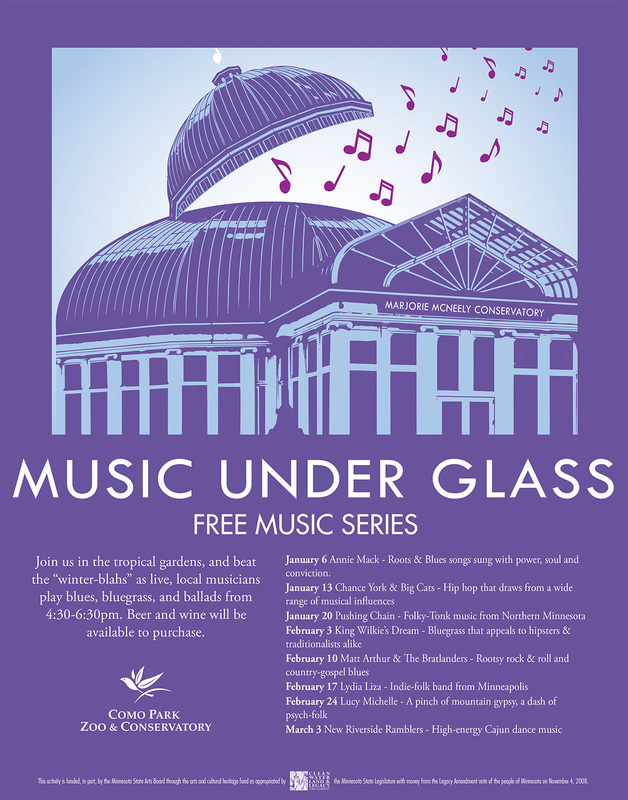 A free program 10-Noon every Thursday. Perfect for the 1-3 year old to meet animal and plant visitors, see story time, play games and many other fun activities. Different theme each week! For adult audiences, Como Park Zoo and Conservatory will provide “Natural Wonders.” This interactive slide show presentation will highlight the science of biomimicry. Amazing technological advances have been made in all areas of science. Many of these advancements have been inspired by plants and animals. Participants will learn more about how nature is helping scientists clean up oil spills, reduce energy consumption, and make advancements in aviation just to name a few. The Natural Wonders lecture is approximately 45 – 60 minutes in length and appropriate for groups up to 100. Power point projection is utilized and requires appropriate viewing space. Washed Ashore: Art to Save the Sea, a massive, colorful, traveling art exhibit will debut at Como Park Zoo & Conservatory on June 23nd. 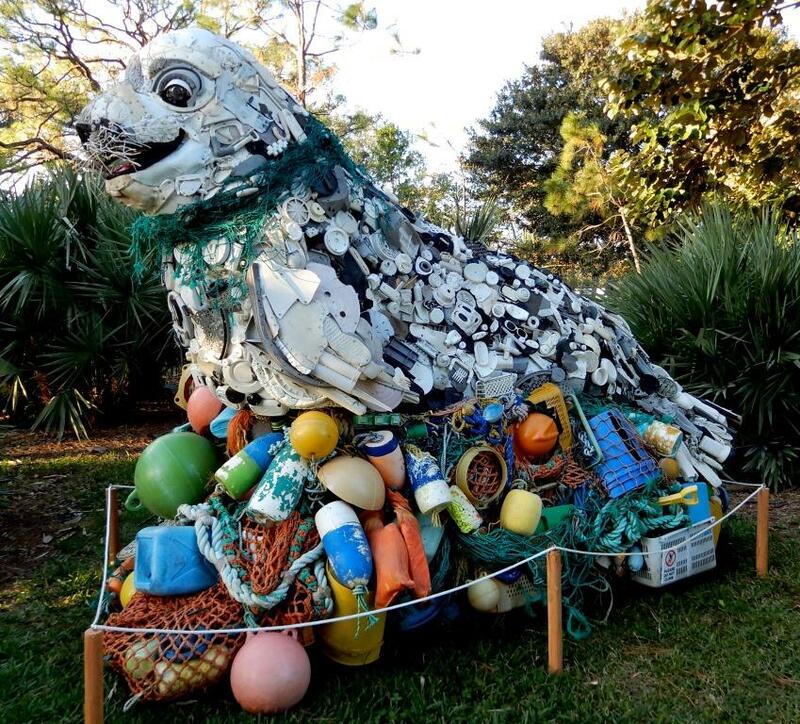 The Washed Ashore exhibit features giant sea life sculptures made entirely of marine debris collected from beaches to graphically illustrate the plastic pollution found in our oceans and waterways. The artwork will be combined with scientifically based educational signage to teach visitors about ocean stewardship, responsible consumer habits and how every action counts to help save our seas. 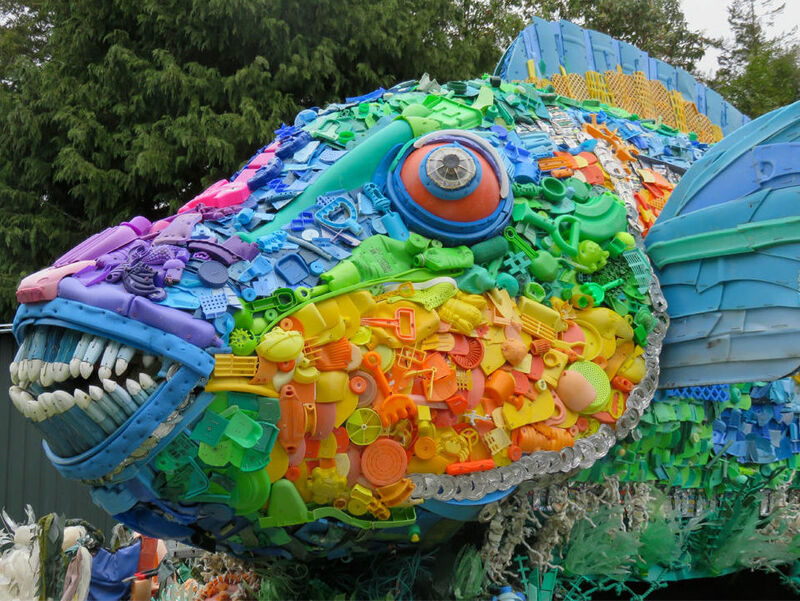 Como will be home to several pieces, including “Hugo”, a nine-foot-tall whale tail, and “Priscilla”, a sixteen foot long Parrot Fish, both made out of plastic toys, buoys, toothbrushes drink bottles, bottle caps, flip flop cut-outs, hair brushes ,and other plastic garbage picked up on beaches. The exhibit offers Como’s visitors a powerful, visual reality of the proliferation of plastic pollution in the world’s waterways through representations of marine animals using thousands of pieces of plastic in every color of the rainbow. Washed Ashore is an environmental education project that uses art to raise awareness to the tragedy of plastic pollution in the oceans through community involvement. It has taken thousands of volunteers and tons of marine debris to create the monumental sculptures that now make up the Washed Ashore: Art to Save the Sea exhibit. “Washed Ashore encourages conservation by inspiring guests to be part of the solution to reduce, reuse, repurpose and recycle” said Michelle Furrer, Como Park Zoo & Conservatory Director. “With this exhibit we hope to educate and motivate our guests to learn more about the tragic issue of pollution in our waterways”. The Washed Ashore exhibit is free and will run from June 23, 2018 through October 21, 2018. Improve interpretive graphics, add interactive elements, and expand encounters for both the guest and animal to better make the connection to inspire the public to value the presence of living things. 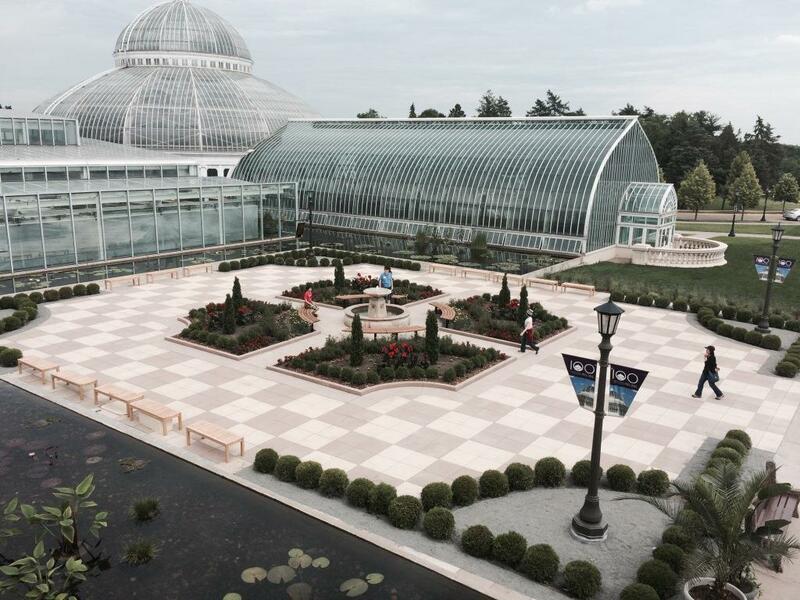 Como Park Zoo and Conservatory unveiled the new Centennial Garden on June 19, 2015, a stylized nod to the traditional European landscape gardens that drew visitors to Como at the turn of the century. The Garden will welcome guests into the Visitor Center and serve as a landmark to remember all of the community members who have made the past 100 years possible. The Centennial Garden was designed to collect and filter rainwater into an underground cistern for reuse as irrigation water. Introducing Senior Strolls, a new, free program for our 55 and-up-aged friends, offering an opportunity to experience Como Park Zoo & Conservatory before it opens to the public. Each month those 55+ are welcome to partake in active social and learning opportunities complete with special activity stations before the doors open to the public at 10 a.m. Also available is the opportunity for a leisurely stroll through the lush greenery and warm confines of the conservatory; or, in the warmer months, a walk amongst the amazing animals and world class exhibits on the grounds of the zoo. This new program is a great way to get active and social, with a little adult learning thrown in to spice it up! The first Wednesday of each month a Sign Language interpreter from SportSign will translate some of our daily value added programs for our visitors. Other languages to our schedule as the year progresses. Como Park Zoo and Conservatory is an energetic, colorful place full of sensory stimuli, and we know this environment can be overwhelming for some guests. These are some ways of the ways that Como strives to provide a positive, welcoming experience for every visitor. Plan out your day before you head to Como! Created in collaboration with the Autism Society of Minnesota (AuSM), this guide helps visitors reduce their anxiety about new experiences by explaining what to expect step-by-step as they explore the Zoo and Conservatory. Join us from 9-10 a.m. during the listed dates for an inclusive experience at Como Park Zoo & Conservatory. Spend time exploring exhibits, and activities designed for individuals on the autism spectrum and their families. Use the “social narrative” and the “create your own visual schedule” to help prepare you for your Autism Friendly Early Entry day.